A new study shines light on the risk factors for severe maternal morbidity and the reason why morbidity is rising. Population-Based Study of Risk Factors for Severe Maternal Morbidity by Gray et al. appears in the current issue of Pediatric and Perinatal Epidemiology. And they note that SMM is rising. The authors sought to investigate risk factors for SMM and why it might be rising. The distribution of maternal demographic and obstetric characteristics among cases and controls was examined. 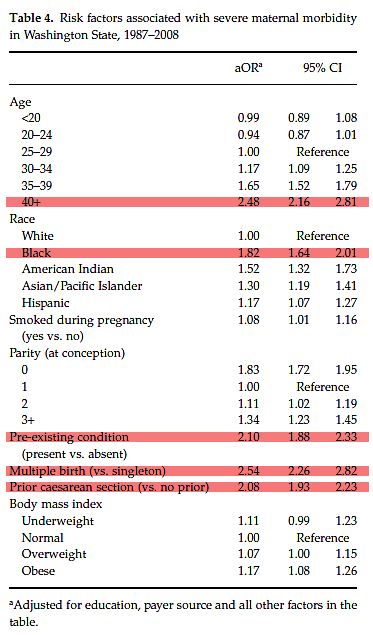 Maternal characteristics included age, race, level of education, marital status, maternal smoking during pregnancy, payer source, parity and preexisting conditions. Adequacy of prenatal care as measured by the Kotelchuck index, delivery method, having a multiple birth, delivering a low birthweight infant. … Receipt of a blood transfusion was the most common qualifying SMM and occurred in nearly half of all cases, followed by hysterectomy (11.2%), and respiratory failure (10.9%)… Our study did not assess severe haemorrhage and uterine rupture as unique SMM categories, although transfusion is a surrogate for severe haemorrhage and uterine rupture commonly is associated with hysterectomy. 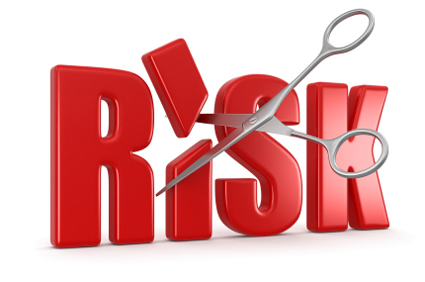 Which risk factors increased the likelihood of SSM? Between 1987 and 2008, 9485 women had one or more SMM in Washington State. Women with SMM were more likely to be older, non-White race/ethnicity, unmarried, to have a lower level of education, to be at the extremes of parity, to have a pre-existing medical condition and to receive Medicaid/Medicare compared with controls. Women with SMM were more likely to have a multiple birth, to deliver by caesarean, to deliver a low birthweight or preterm infant and to have received intensive prenatal care as compared with controls. In the chart below, I’ve highlighted the risk factors that are most strongly associated with severe maternal morbidity. What can we say about these findings? 1. None of the 5 most important risk factors modifiable, either by the patient or her provider. These are advanced maternal age, race, pre-existing medical condition, twins or higher order multiples and previous C-section. 2. Homebirth advocates like to pretend that these are not risk factors, but they are and all women who face them should be counseled that they are not safe candidates for homebirth. Natural childbirth advocates also like to pretend that these are not risk factors but, as usual, they are wrong. Women who face these risk factors may need additional monitoring and interventions in order to have a safe birth. 3. The increase in severe maternal morbidity can be explained by the rise in prevalence of the risk factors. Maternal age has increased, and therefore the incidence of pre-existing medical conditions have also increased. The incidence of twins and higher order multiples has also increased. 4. Previous C-section is a major risk factor. Unfortunately, the study did not distinguish between women who attempted a VBAC and women who scheduled a C-section, so we cannot determine if it the previous C-section that is the risk factor or whether the complications are a result of attempted VBAC. The bottom line is that the increase in severe maternal morbidity reflects the changing demographics of the childbearing population, not the quality of obstetric care. And when it comes to the quality of obstetric care, the main problem is underuse of technology, not overuse. Therefore, increased reliance on midwives has little to no place in any efforts to reduced severe maternal morbidity and homebirth has no role at all.